OMG if you can handle the oink, this is the best toy ever for your dog. We have several of them at friends and family members homes, and Gracie knows to look for ‘piggy’ wherever we go. She adores this toy… It weathers well, and the oink can be pushed in if it gets too much for you! 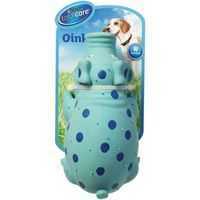 How would you rate Total Care Toy Oinker?